Celebrate the birth of a child with a personalized baby gift. Whether you choose a personalized baby gift basket filled with essentials like a monogram baby blanket, plush toys, security blankets, travel wipe cases, baby towels & baby pillows or one of our awesome super soft baby blankets with a three letter monogram or two names embroidered absolutely free; your baby present will be professionally wrapped and a hand written card with your personal message will be included. The arrival of a newborn is an amazing and treasured event. We are here to help you celebrate these wonderful moments with the finest personalized baby gifts from our extensive collection of personalized baby blankets including cashmere baby blankets, organic baby blankets, monogram baby blankets, custom stroller and crib blankets as well as luxury blankets for newborns made in the U.S.A. exclusively for our customers. As mothers and grandmothers, we know what new moms want and what their infants need. We created our first personalized baby blanket in 2003 and now our collection numbers over two hundred. Namely Newborns brings affordable luxury to the nursery and has recently added cool gifts for the new mom featuring cashmere ponchos and travel wraps. Need Help Deciding on the Best Baby Gift? Our personal shoppers are available to assist you and to make shopping fun. Personalized baby blankets are our number one seller. From trendy to traditional, they come in all shapes and sizes. This includes oversized comfy cozies with animal heads that are useful for tummy time and even tiny blankees that are made for cuddling. With hundreds of choices ranging in price from $30 for a classic stroller blanket to up to $400 for a deluxe custom cashmere crib blanket, you are guaranteed to find the perfect blanket for your budget. 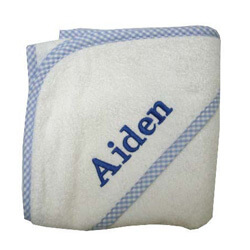 Hooded towels are a recommended product for any newborn. Bath time is an important part of the daily routine and mom can never have enough of these essentials to keep baby warm and dry after this ritual. We have the softest, cutest collection of cotton tubbies, character and appliqued baby hooded towels, complete with matching wash clothes from 3 Marthas and Yikes Twins. Plush toys are a popular item with children of all ages. Trusted names like Jelly Cats and Baby Gund create "go to buddies" in the shapes of puppies, bunnies, elephants and teddy bears that will be your child's best friend forever. 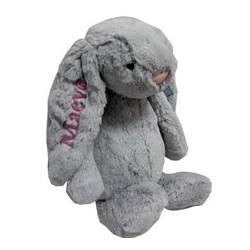 Imagine how cute a stuffed toy will look with your child's name embroidered on the ear. Security napping blanket with adorable animal heads are an important part of every layette. Having multiples of this essential may be critical to preventing a melt down if one happens to be in the wash or misplaced during travelling. Travel and nursery size wipe cases are no longer the ugly duckling of the nursery. We cover our cases with designer fabric and custom embroidered names. They quickly become accessories that are as beautiful as they are useful. 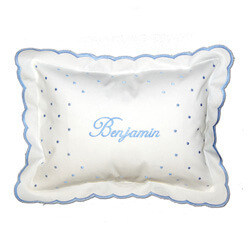 A beautiful custom pillow embroidered with birth date, pounds, ounces and weight will be a treasured keepsake and a wonderful accent to the nursery. How Do you Personalize a Baby Gift? We make it easy for you to choose your favorite embroidery color and font. With over three hundred thread colors, our embroidery staff will pick the right shade of your favorite color to accent your selection. A team member is always ready to make suggestions, help with a monogram or assist with picking the perfect font for the embroidery. Our commitment is to make it easy as possible to find the perfect personalized present for the new child in your life. Each order is promptly processed and includes a personal gift card message. Professional gift wrapping, rush embroidery and overnight shipping are available at your request. We ship worldwide.